increase speed after x seconds — Welcome to the GameSalad forum! so basically for 10 seconds I have actors moving down the screen (270 degrees) and they are at a speed of 150. What I am trying to do is increase the speed up to 200 after 10 seconds. how can I do this? Use a timer to determine when 10 seconds have passed. Make sure that your speed value is an attribute rather than a constant. Within the timer behavior, change the speed attribute to 200. 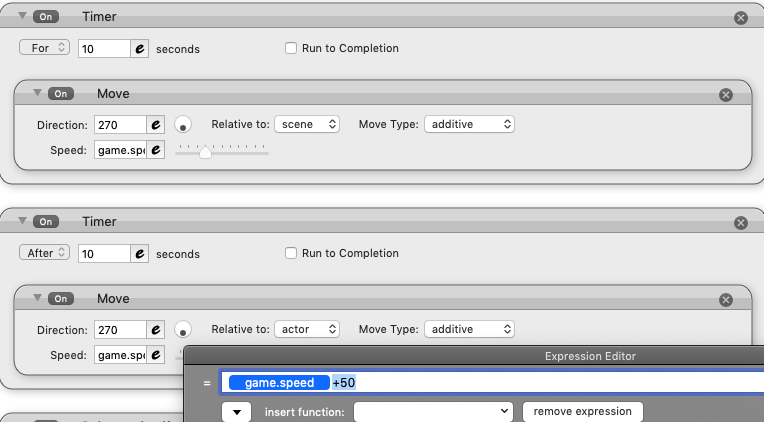 Of course, you must use the motion attribute: self.velocity to command the speed of the actor... this is why you must use -150. Its okay now, I got the change of speed working thank you!! That way, if you have other changes you want to make to the speed, you only need a single Move behavior.